French neurologist Paul Nogier had resarched and developed a zone on the ear corresponds to an organ or a system.Treatment which use points on the ear to heal the body is called auriculotherapy. Stimulate the corresponds point on the surface of ears (there are more than 100 points) exclusively by titanium seed sticker with Swarovski to support your beauty and health.It's looks fashionable just like earrings. Titanium seed sticker without Swarovski is available. Everyone has diffrent appearance of ears and has diffrent responce points.So use special probe that design for auriculotherapy inspect actual points by electrical resistance.There is no pain at all.You can easily feel that probe find coresspond point since that make diffrent noise. There is some diffrences on ear map of them.So select the points that can be expect better result for your condition. 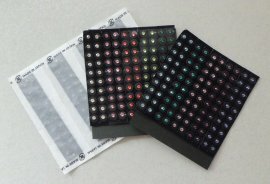 Swarovski on titanium seed sticker is official products.Enjoy brightness of genuine.11 colors available. Titanium seed has less risk of skin irritation.Enjoy like jewel without metal allergy. Sticker is transparent and unnoticed.Without swarovski is invisible. ✽ No acceptaion of person who has a heart pacemaker and any inflammation of ear,the pregnant or lactating and small children. ✽Relief menstrual pain.Reduce gynaecological symptoms as menstrual irregularity and menopause. ✽If your symptoms or condition made by the side effects of the medicine,auriculotherapy is ineffective. ✽There are individual differences of effectiveness.Some feel better instant and others realize gradually with continueing.Effect is mild that you will be able to feel it as little diffrence in daily life. ✽ There is a lot of reason and corresponce points for each symptoms.Change the combination of points will help to realize results sometime. ✽There is no product like dietary supplement for sale. ✽For inside of the ears is recomened to use sheets without Swarovski to avoid jewely will fall in the cavity of the ear. Full in record and discuss about truble and wish of health and beauty aspects.Introduce the responce points fit to purpose and precautions. 1.Lie on the bed.Antisepticisesurface of ear for cleanness and help stickness of sheets. 2.Test operation of probe and confirm reaction sound. 3.Slide the tip of prove around coressponded point and mark it that has strong responce. ✽Auriculotherapy with Jewelry is NOT medical practice. ✽No acceptaion of person who has a heart pacemaker,the pregnant or lactating and small children. ✽When you have wound,rash,rough skin,any inflammation of ear,please wait until its heal completely. ✽Do NOT use them longer than 10 days or reuse. ✽During use,if you feel pain,wrongness,uncomfortable and lassitude,remove them.Consult to doctor if previous symptoms made by sheets. ✽Please note that there is possibility that titanium seed and Swarovski fall in the cavity of the ear.If it happen,consult to doctor.